This traditional, short-scale parlor is a naught-but-nice addition to the Faith Mercury Hi-Gloss series. Faith's Hi Gloss series are high q.. This traditional, short-scale parlor is a naught-but-nice addition to the Faith Mercury Hi-Gloss series. 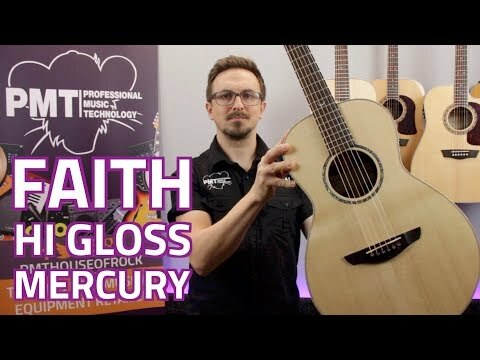 Faith's Hi Gloss series are high quality, luxurious feeling acoustic guitars, featuring all-solid construction finished in a beautiful, hard wearing high-gloss lacquer. The Mercury is a shorter scale, parlour sized guitar that feels compact and comfortable to play, but still delivers a rich tone with plenty of volume. It features a solid Englemann Spruce top with master luthier, Patrick James Eggle's own special design quarter-sawn Spruce X-Bracing, solid Rosewood back and sides with flamed Maple binding. Rather than being glued in like on most traditional acoustic, the satin Mahogany neck features a bolt-on design, and it's fitted with a Macassan Figured Ebony fingerboard with 20 frets and a lovely mother-of-pearl 12th fret marker. To match the fingerboard, the bridge and bridge pins are also made from ebony, and up on the headstock, a set of gold Grover Tune-O-Matic tuners keep tuning stable. A simple, but beautiful looking, sounding and playing guitar, the Faith Hi Gloss Mercury also comes with a quality hard case to keep it safe.